Addium Review – Smart Drug or Dud? Home » Nootropics » Addium Review – Smart Drug or Dud? Some drink coffee or tea, some exercise, and some take supplements to get them through the day. Alternatives to prescription medications like Adderall and Vyvanse are quickly taking over college campuses and boardrooms across the US, and there’s no signs of a slowdown. Recently we’ve been reviewing more and more of these nootropic supplements, mainly because we get so many guys asking about them. One recent supplement I got a question about is called Addium, which is apparently a smart drug that is sending shock waves through the medical community. But does it really work as good as they say it does? Well, throughout this review you’ll learn about the formula behind this supplement, what customers are saying about, the marketing, and more. According to the products own website, Addium is a cerebral enhancement complex that is intended to help increase your energy, maintain focus, and boost your brain performance. According to the marketing I am reading behind this pill, it seems to be much more then that. So what’s in Addium that apparently makes it so effective? Well, for starters the ingredients listed include Vitamin B3 Niacin, Vitamin B6, Caffeine, L-Theanine, Vinpocetine, Alpha GPC, Tyrosine, Gaba, and Bacopa Monnieri. However, these studies involved a very small number of participants and the data was not found to be conclusive. From my experience (which you can read about below) Addium contains a TON of caffeine, although the label doesn’t tell you exactly how much. GABA (Gamma-Aminobutyric Acid) is a well-known amino acid that plays a role in reducing neuronal excitability throughout the nervous system. (Source: 3) However, GABA has a very hard time crossing the blood brain barrier in significant quantities, so its effects are limited. There also appears to be another product with a similar sounding name called Adderin that just popped up on my radar. My suspicion is that this supplement is the same as Addium, but I can’t say for sure. The bottle / label closely resembles that of Addium, with a few small changes. I actually had a chance to try it out, click here to see my review. The product itself is not that expensive, with a one month supply running at $40 a bottle. They also offer discounts for larger orders, as well as offer a 30 day money back guarantee, which is not uncommon in the industry. I checked around on a few other sites, and other then Amazon, it doesn’t appear to be sold at any retail stores like GNC, Walgreens, CVS, or Walmart. I clicked on the ad and it took me to a page that, at first, looked like an independent article printed in a scholarly magazine. Through this article there’s mention that their supplement was featured on the hit daytime TV show “The Doctors” (and Dr OZ) and that it was also the inspiration for the movie “Limitless” starring Bradley Cooper. You can see the real tweet here if you like as well. 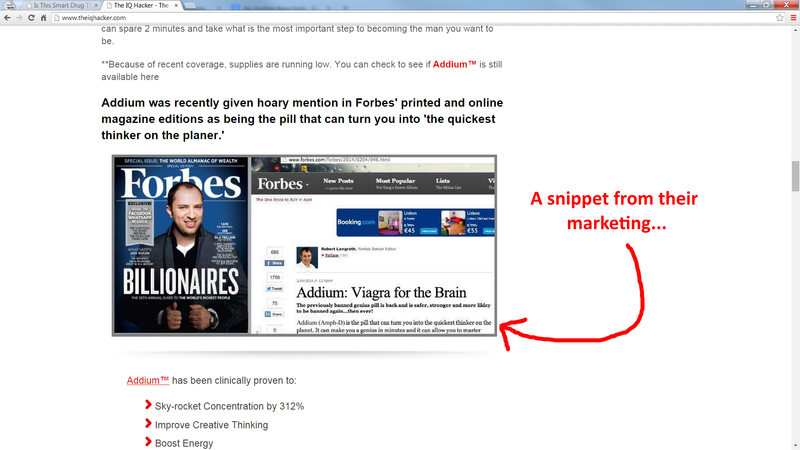 But if you check out the REAL Forbes article, you’ll see there is no mention of Addium whatsoever. 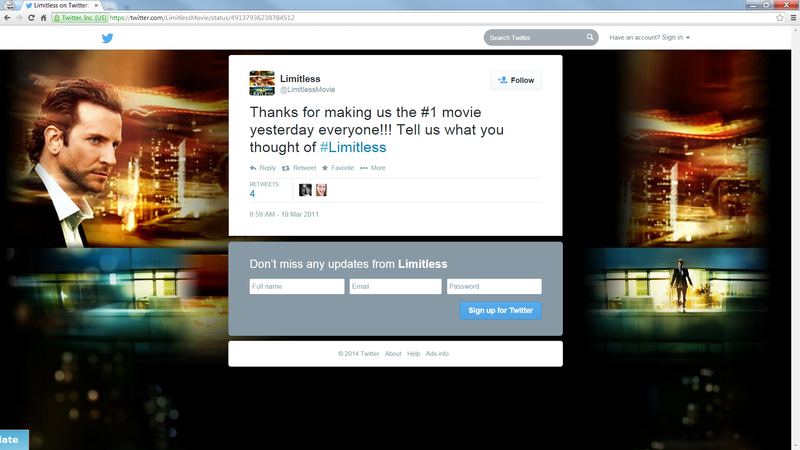 Just like the Limitless Tweet, it’s false and misleading advertising that leads you to believe it has some real credibility. While were not sure if the actual company is behind it, or it’s just an internet marketer who’s making these claims, but there’s no denying their existence. I’ve written about many other supposed brain boosting supplements that use the EXACT same marketing for their products, including this one, Neuro 3X, Intellux, and Synagen IQ. Sometimes they even make claims that celebrities like Will Smith and Leonardo Dicaprio are using them, and I prove it wrong each and EVERY time. 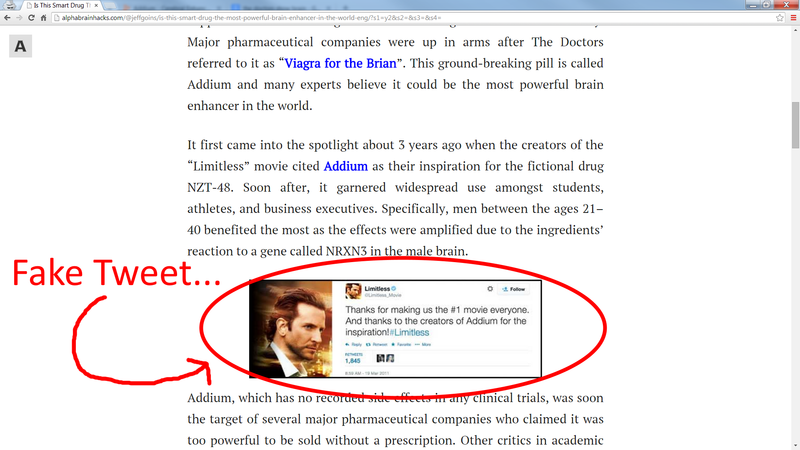 Finally, the makers (or marketers) of Addium state that their supplement was involved in a clinical study by the Nottingham Clinical Trials Unit, or NCTU for short. However, upon investigating their website I couldn’t find any published information concerning Addium. If a supplement like this had ACTUALLY been clinically studied, don’t you think they would be highlighting it more on their website? As far as finding Addium reviews, there was actually a decent amount of them on a few online site like Yahoo answers and Amazon. However, the legitimacy of these reviews can definitely be called into question. For one, I read through a ton of the reviews on Amazon, and almost EVERY SINGLE reviewer literally had only left a review of Addium, and not ONE other product. This is a classic sign of a fake amazon review, which is very prevalent. Basically, what companies will do is hire people to create a fake Amazon account and “review” their product. You’ll see the classic signs of this when you click on the “See all my reviews” and notice that they haven’t reviewed anything else. In fact, the majority of the negative reviews you’ll find on Amazon all point out the very same thing. The same thing go’s for the reviews I found on Yahoo. 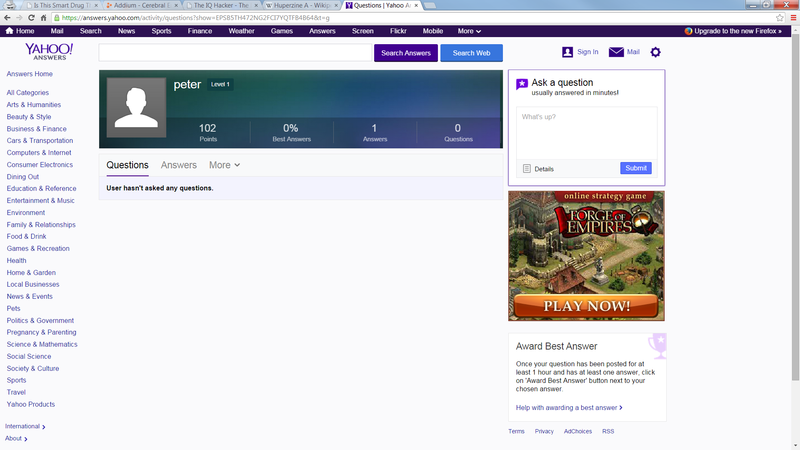 There’s about 18 answers on there, all speaking very highly of their results with Addium. 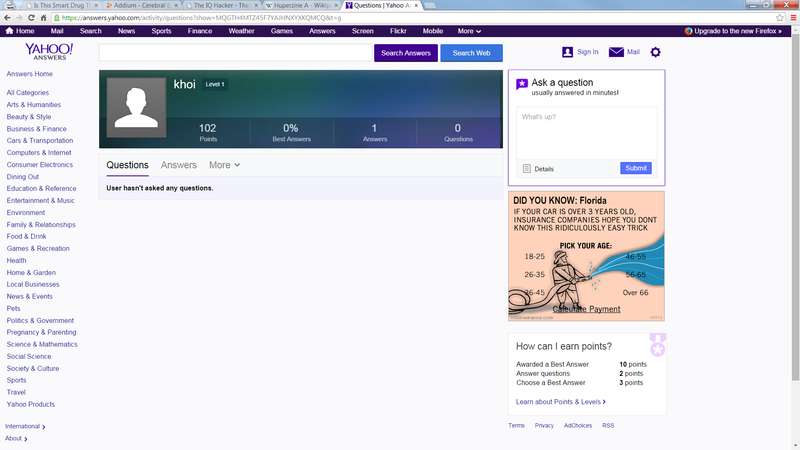 However, if you click on the name of the person leaving the review you’ll see time and time again that it is LITERALLY the ONLY answer they have ever left on Yahoo Answers. Again, this is pointed out by the people who had a “negative” effect with the product. The only “credible” review I could find was on Youtube, where a man describes his experiences with Addium. If you can get through the first 8 minutes or so of him badly pronouncing practically every ingredient on the label, and then giving a description of each, as well as saying the word “beast” close to 20 times, he finally gets to his personal results. He uses the example that he could remember someones last name that he couldn’t remember for months, which is actually quite comical. All in all he says his results were pretty good, describing it as a very positive experience. The makers of addium were kind enough to send us a bottle of their supplement to test out and I finally got around to trying it. If you’ve read some of the reviews at the bottom of the page, you can see that I could / would be a little apprehensive about taking it. Comments like “it felt like a cocaine comedown” and “I felt like I had 10 mugs of strong coffee” can definitely scare the bajeezsus out of anyone considering taking it. However, in the interest of keeping a fair and honest review blog, I decided to “take the plunge” and give it a go for a couple of days at least. I would honestly say they were some of the biggest I have ever seen in a supplement, and I’ve tested HUNDREDS of supplements over the years. The directions on the label state that you should take 1 capsule daily, though it doesn’t clarify whether or not you should take it on an empty stomach. I’m a bit sensitive to caffeine and other stimulants, so I decided to take 1 capsule with breakfast. It took about an hour to kick in, but man when it did, I felt the same as one of the other reviewers did. It felt like I had drank 5 cups of coffee in 5 minutes. Jittery hands, a shaky voice, and an incessant nervous twitch in my eyelid. Definitely not a comfortable feeling. I ate a late breakfast and the feelings seemed to subside. Click Here to see how Addium compares to my top choice for focus and concentration issues, Optimind. As the hours passed I have to admit I did feel a bit more “motivated” to get some work done. I wasn’t setting any records as far as getting tasks done, but I was working on tasks I would normally put off for a later date. I also felt less distracted, and even a bit more sociable than usual. I also noticed I felt a it more “calm” then usual, which I would attribute to the L-Theanine in Addium. By the end of the day I definitely started feeling a pretty big crash, which based on the way I felt earlier I wasn’t totally surprised.The most noticeable effect was a headache….a splitting headache. Fortunately, I popped a couple of advil and it seemed to alleviate it pretty well. I also felt a bit lethargic, kind of like the feeling you get after a REALLY long day.The kind where you just want to sit around in a dark room and watch reruns of Breaking Bad. I decided to take it over the course of about 4 days to see its “longer term” potential, and I did feel a bit more focused and concentrated on tasks. It wasn’t anything “ground breaking”, but the cognitive effect was definitely there. For me, the effects seemed to kind of wear off over the weekend. I thought about upping the dose to 2 capsules, but they caution against that so I decided not to. As a dietary supplement, the label says you should take 1 capsule daily. I’m not sure if you’re supposed to take it on an empty stomach or not, but I would suggest you do so on your first dosage to assess your tolerance. According to what I’m seeing, you generally start to see results in the first 30 minutes, with the biggest effects seen after about 2 hours. Users report the effects wearing off about 6 hours after the first dose. That’s tough to say, because really ANY supplement can cause one side effect or another, and Addium is no exception. For example, it does contain caffeine, which has the obvious side effects like increased blood pressure, anxiety, and a jittery feeling. It must be noted that the quantity of caffeine is not indicated on the label, so there’s no way to compare it to say, a cup of coffee. When I originally wrote this review there weren’t too many people complaining of side effects. HOWEVER, in the past few months I’ve gotten ton’s of feedback on Addium and the #1 complaint seems to be that it’s causing a rash to develop on the face, neck, and several parts of the body. Pretty scary stuff, and it turns out that it’s likely the heavy Vitamin B3 (Niacin) content, which is 30 mg. The makers of Addium actually responded to this guy on his Google + page, and said that they were planning on completely removing Niacin from their product. Was Addium Really Featured on CNN / The Doctors TV Show / Etc.? Likely not. There is an article about Addium on the CNN website, but that’s on the iReport section, which is not vetted by professional journalists or documented / researched properly concerning its claims. Basically what that means is anyone can post practically anything and pass it off as a journalistic piece. Within the article they also mention the Limitless Movie reference on Twitter, which as you’ve already seen above has been proven false. Is this the same as Adderin? In my personal opinion, yes. I wrote my Adderin review back in August of this year, and as I noted there the first thing I noticed was the striking similarities between Addium and Adderin. The most obvious similarity was the formula. It was nearly IDENTICAL to that of Addium, minus about 10 mg of Niacin. My thought is that because Addium is getting a lot of negative publicity, the makers decided to just create a totally new brand and market it under a different name. Most of the “real” reviews are not very positive. They use deceptive marketing to promote their product. There seem to be plenty of people experiencing side effects from it. My personal results were not very favorable. There are much better / proven supplements on the market. 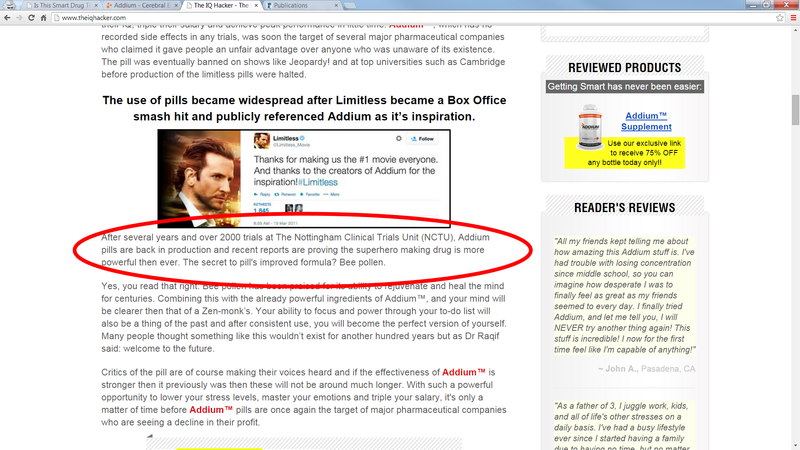 I’m a bit torn on Addium…it’s definitely not some “limitless” pill that’s for sure. I didn’t feel as though I could make millions on the stock market overnight, or solve complicated mathematical formulas at the drop of a hat. I’ve taken prescription medications like Adderal and Vyvans before, and Addium felt nothing like them. 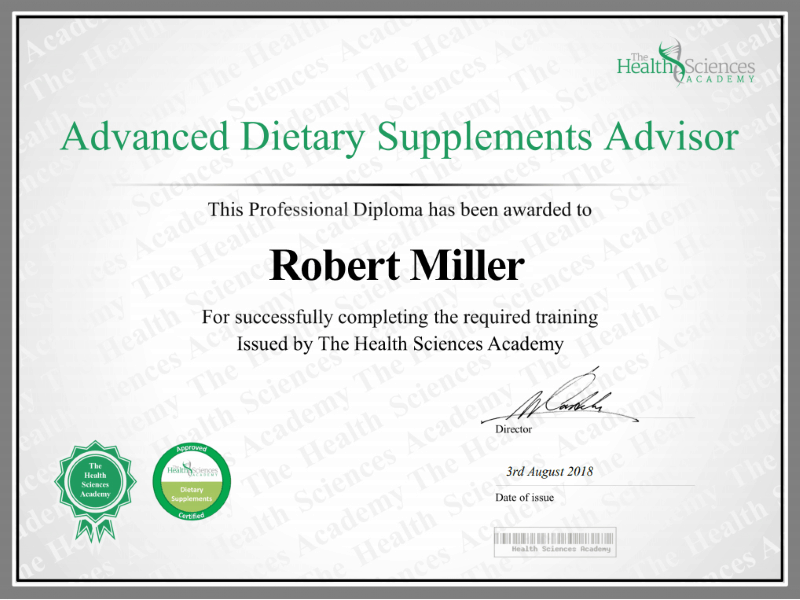 Apart from the Addium side effects that I feel came from the niacin content, I did feel a bit more motivated to get things done, but nothing truly revolutionary. Perhaps if one was to take this on a consistent basis it might have a more profound effect. I’ll continue taking it over the course of a week to see if there’s any difference, so check back for further updates. Got it yesterday, took first pill today with my regular cup of morning coffee. Nothing else to eat. Bad move. After about 2 hrs I feel like a had 10 mugs of strong coffee and I almost threw up. So don\'t take it on an empty stomach. I normally don\'t eat breakfast. Cold hands, jittery, couldn\'t hold a phone conversation, had to hang up - feel very hyper. I like to multitask which makes me loose focus sometimes, so I wanted to see if this pill would help me change that. Instead I feel like doing 20 more things all at the same time. I\'m not happy with the results so far. However it is my first day trying it. We shall see. I take one before work and it does give me a boost of energy past lunchtime but the one thing I noticed is that it makes me sweat a bit in the first 20 minutes. Not too much of a problem, but good to note. I have struggled with ADHD my whole life, it was easy to deal with in high school because there was always so much going on. In recent years I’ve had to start taking Adderall in order to help me stay on task and keep everything organized at work..
I’ve been looking for a solution to avoid having to take Adderall the rest of my life when I came across Addium.. I’ve been taking this for a few weeks now and I’ve been able wean myself almost completely off the Adderall..
I’m focused, Alert, and have more energy than every! I’m sure it’s not for everyone, but since the price is reasonable per bottle, I would recommend to everyone to at least try it and keep an opened mind. *side note: If you’re taking Adderall, cut your daily intake of it in half. The first day I got the Addium I took my 20mg of Adderall and then took 1 Addium an hour later… I felt like I was ‘geeked up’, for lack of better words, about 30 mins later. So based on my experience these last two days I would say this supplement is like 4 energy drinks minus the hyper activity. I drink caffeine all the time and it has stopped having an effect on me, however after taking addium I suddenly felt extremely motivated to do all sorts of things I've been putting off. I like taking Addium, I do work long hours at work and always need something to keep me up. Addium does seem to do the trick. On some days I have noticed that it has given me a bit of an upset stomach, but that might also be because I barely eat on some days. I noticed your review pointed out that Addium likely has a lot of caffeine, which is probably true, but it seems to do much better for me than taking 4 hour energy. 9 out of 11 people found this question helpful. Previous Previous post: BlueFusion Male Enhancement Review – Does It Work? Next Next post: Fat Burn X Review – Miracle Fat Burner Or Dud?